Roundup While Microsoft partied the week away in Orlando during its annual Ignite shindig, there was a significant lack of build news as Windows 10 crested an important milestone. And as Skype Classic reached the end of the road, other Microsoft apps also faced the axe. The big Windows 10 build news last week was that, er, there was no Windows 10 build news. For the impending October update, at least. The move has led to fevered Windows Insider speculation that maybe, just maybe, build 17763 is The One. Add to that the ongoing speculation regarding tomorrow's event (no, not the Microsoft UK Government Azure Forum – The Register might have stood a chance of getting an invite to that one) and Windows fanboys are positively giddy with excitement. Tomorrow's New York event is all about Surface hardware, most likely a spec bump for the Surface Pro and Surface Laptop, and an announcement of a release date for Windows 10 seems probable. However, the current Redstone 5 build has yet to make the jump from Slow Ring to Release Preview, so we'd advise not holding your breath for a download link. As we tip into October, and the month of the Windows 10 October 2018 Update, ad slinger AdDuplex published figures showing the April 2018 Update was nearasdamnit at the 90 per cent mark in terms of Windows 10 usage. The figure is not quite as high as that achieved by the Fall Creators Update, but the speed at which 1803 rolled out is impressive nonetheless. The install base of Windows 10, however, remains stubbornly below Microsoft's lofty goal of one billion. Departing Windows boss Terry Myerson commented that the OS was running on almost 700 million devices back in March and Microsoft confirmed the figure at Ignite: yes, Windows 10 is now on more than 700 million machines. Six months after Myerson reckoned Redmond was "approaching" the figure. It is hardly gangbuster growth, and as Microsoft looks to the cloud more than grungy desktops, one billion will remain out of reach for a good while yet. Also at Ignite, Microsoft warned that the days of Office Mobile were numbered. The platform consists of touch-enabled versions of the hugely popular Office suite, coded as Universal Windows Platform (UWP) apps. UWP apps can, in theory, run on all Windows 10 devices and the cut-down feature set of Office Mobile was aimed at Windows Phones or smaller Windows 10 tablets. Alas, neither of those are really a thing any more and so it comes as little surprise that Microsoft plans to ignore the apps until they, well, just go away. Development will, of course, continue on the Android and iOS versions, as well as the web and Win32 incarnations of the venerable suite. The sole survivor of the purge is the OneNote UWP app. What this means for non-mobile devices (such as the Surface Hub) that use the UWP version of the suite is unclear, and The Register has asked. With Redmond now very keen on Progressive Web Apps (PWA) and UWP having singularly failed to set the world alight, new life may yet be breathed into the platform. As Ignite wound down in Orlando, Microsoft announced it would be back in the city in 2019. An eagle-eyed Reg reader noted that for some of the Microsoft product line at least, 2019 was already here. 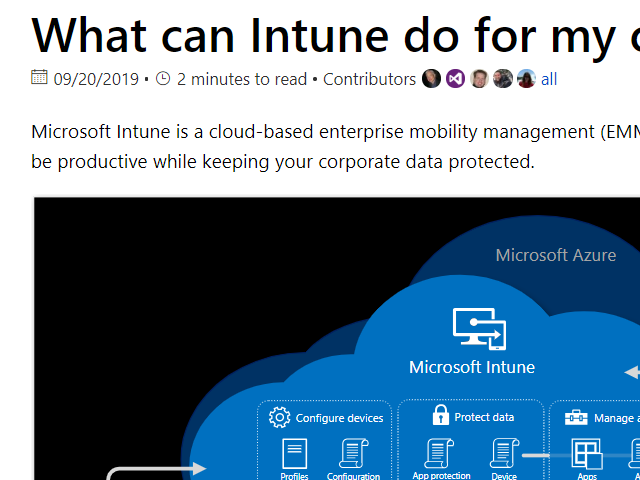 So, as well as managing devices, it appears that Intune can also open a portal to the future. And yes, in the future it is just as much of a pain to deal with all the disparate devices employees insist on dragging into the premises. The Register fears that the Back to the Future franchise would have been considerably less fun with Marty McFly locked in an Azure data centre while Doc Brown attempted to get it hit by lightning.